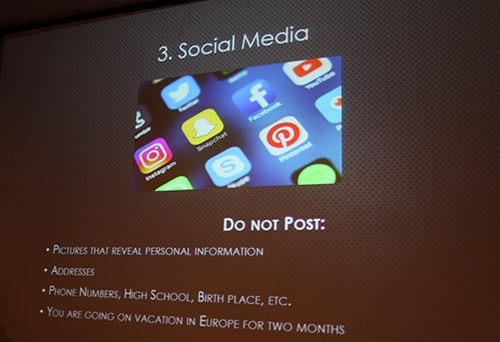 UAT Cyber Security professors Wayne Kibbe and Mason Galatas teamed up to present a slideshow on the basics of cyber security and how to protect yourself the best you can from hackers. Online shopping is a risk - make sure to use credit cards versus debit cards due to extra built-in protection from credit card companies. Gift cards are even more secure. Social media can give away too much personal information. Avoid sharing your address, phone number, birthdate and schools you or your family has attended. Also, don't advertise on social media that you are on vacation. You'll catch attention from the wrong people! Social engineering - be careful what information you share with people who are randomly and overly curious in specific personal questions. Free WiFi may look legit, but beware it could be disguised with a common name like "Starbucks Guest" so the customer is likely to assume it's safe and for the use of Starbucks customers. Use a Virtual Private Network (VPN) to be sure communications are safe, even on a public network. Be aware of other tech in your house that may connect to the Internet such as an XBox, Smart TV's, refrigerators, thermostats and more. These devices can be vulnerable to attacks, as well. Update your software. Hackers commonly target software that does not update automatically because users are less likely to run updates regularly themselves. This can create opportunities for bad guys to infiltrate the program. Passwords are hugely important so don't be generic. If you struggle in creating a unique password, try multi-factor authentication. In addition to multi-factor authentications, applications such as Lastpass can create lengthy and random passwords for you. For more information on cyber security and how you can reach a higher level of training and education, please click to learn more about UAT.